Save$$ on designs when you purchase CD Design sets. Free shipping this month! Collect them all! 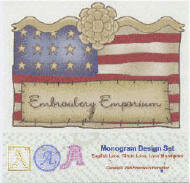 Each CD comes with Embroidery Emporium designer label and printed color change sheets. Pre-cut lettering coming this month. I finally got an applique cutter! I will be pre-cutting the applique lettering designs and offering them as kits soon. Also, I will be offering custom cut applique service. I will send an announcement soon. Be sure you have signed up either on Kidsembroidery Yahoo Group or my embroidery list. You can sign up on the free embroidery design page by clicking here. Instant Download coming soon! Soon you will be able to get your designs immediately upon successful payment. I am adding instant download to my site. Custom Applique Cutting - Get your applique letters custom cut with an Ioline cutter. email me for quotes on multiple orders. Most alphabet sets and numbers are $25.00 custom cut for each set (2-3" letters). Email me for quotes. Keyboard Alphabet - 2" Alphabets with Keyboards attached! Great for the piano or music lover! Use on linens, t-shirts or sweatshirts. Or monogram a cd cover! Dot Alphabet set on Sale Now!